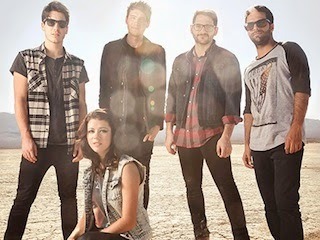 The guys (and girl) of We Are The In Crowd have been hard at work on their sophomore record, Weird Kids, since last February. They wrote in New York, they wrote in Georgia, they wrote in Los Angeles; writing and recording this record was happening at every moment that they weren’t on stage, which is impressive since the band spent the majority of 2013 on tour. With 2014 under way and the record release quickly approaching, lead vocalist Tay Jardine spoke with Alter The Press on the details of the record and what it’s been like transitioning from Guaranteed to Disagree. Jardine explains that the recording process for Weird Kids was actually difficult in the beginning due to the fact that they hadn’t written any serious material together in almost two years. Once they got over that hurdle, the writing process was actually fairly easy. As for the title Weird Kids, Jardine gives lead guitarist Cameron Hurley all the credit. While throwing out names during their writing sessions, this one stuck to the group. Weird Kids is out February 18th via Hopeless Records. Dates and ticket information for the band's upcoming tour can be found here.